Home 2017 October 02 Blog Spotted Owl Supremacy? Apparently, outbreeding is a problem when we’re talking about owls. Throughout the forests of its Pacific Northwest home, the spotted owl, listed as a threatened species, is facing a new challenge. “It’s a nasty situation,” said Susan Haig, a wildlife ecologist at the U.S. Geological Survey in Corvallis, Ore. The spotted and sparred owls are hard to tell apart, and hybrids are not protected under the Endangered Species Act. “This could cause the extinction of the Northern spotted owl,” she said. Like an increasing number of creatures around the world, the barred owl may interbreed itself out of existence—and scientists and government agencies are taking notice. But when we’re talking about HUMAN outbreeding, the rhetoric completely changes. The barred owls just want a better life. They eat the rodents the spotted owls won’t. 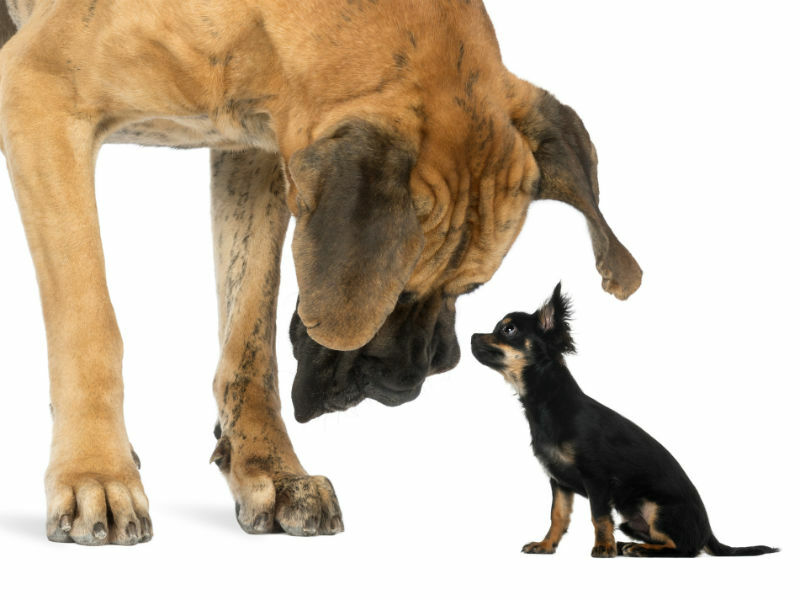 Breed is a social construct. Spotted owls should be saved? That’s hate speech! Spotted and barred owls share 99.9% of their genes. There’s only one breed of owls, the owl breed. All owls need to work together to end spotted owl privilege. No one’s FORCING them to interbreed. You can’t control who owls fall in love with. It’s a forest of immigrants. Diversity is strength. In America, all owls are created equal. Their genes will still be there. What’s the problem? The barred owls just need to assimilate. It’s about owl VALUES. The spotted owl way of life deserves to die. It’s just a demographic shift. Spotted owls should have more babies. All owls came from a common ancestor. You just hate barred owls. You’re being divisive. That only helps Putin. We have an inevitable sparred owl future. If we don’t let in barred owls, the forest will not survive. There are no borders in nature. All forests belong to all owls. 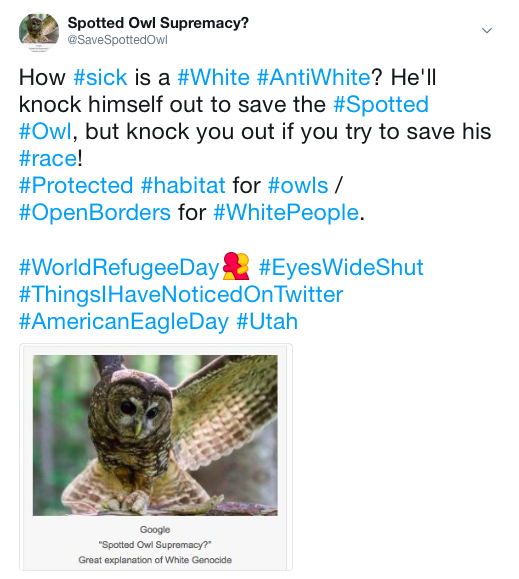 When an owl subspecies is being blended out of existence, that is considered to be a “nasty situation.” But when anyone shows concern for the future of the human subspecies known as white people, they are attacked as racist Nazis, fired or, in Europe, even imprisoned. The US Fish and Wildlife service is actually KILLING barred owls. In desperation to save the rare northern spotted owl, biologists are doing something that goes against their core — shooting another owl that’s rapidly taking over spotted owl territory across the northwest. “If we don’t do it, what we’re essentially doing, in my view, is dooming the spotted owl to extinction,” says Lowell Diller, senior biologist for Green Diamond, a timber company. The Fish and Wildlife Service is starting a four-year experiment to kill up to 3,600 barred owls in the northwest. The birds will be removed from four different forests, two in Northern California, one in Oregon and one in Washington. So it’s OK to KILL to save an owl subspecies but white people can’t even put up a wall without being demonized. Cuban crocodile “supremacy” also seems to be rampant in the environmentalist community. One of the world’s most endangered crocodilians, the Cuban crocodile, is facing a genomic identity crisis. The island’s rare, endemic species has been interbreeding with its more abundant cousin, the American crocodile, creating hybrid offspring and posing a threat to its survival. In each baby, a portion of the Cuban crocodile genome is replaced by American crocodile genes. With each subsequent generation, more and more Cuban genes are lost, and eventually the species could go extinct. Every subspecies is inbred. Every subspecies is created and maintained by inbreeding. The only subspecies told that this is somehow a problem is the human subspecies known as white people. No one tells Asian human subspecies they need to outbreed to stop supremacy or inherited diseases. No one tells the black human subspecies they need to outbreed in 50+ black countries. Saying that inbreeding among a population of 800 million is a problem is silly. Whites have done fine for 40,000 years breeding within their own race. Inbreeding hasn’t prevented them from creating countries everybody wants to live in. Keep up with these excellent articles. I am learning a lot and will be using your memes and ideas in my comments online. Thank you! Our Most Holy Church of Political Correctness will not survive this great article!